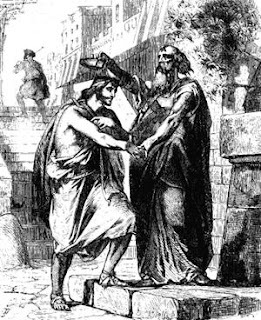 Samuel warned them, but they didn't listen: Saul is anointed king over the Israelites. Voltaire once said something to the effect that an artist will sacrifice fame, money, and the company of beautiful women, in the hopes of refining his craft ... and thereby obtaining fame, money, and the company of beautiful women. Those who aspire to become President of the United States follow a somewhat similar course. That's just sad: Faith Hill, mother of three daughters, a married woman on the cusp of middle age, debases herself at the 2003 Grammy Awards. The spectacle of pathetic pandering she offered was almost half as sad as that provided by the typical presidential candidate. That comparison, I'll admit, is grossly unfair: A prostitute only peddles her own flesh, where a president is in the business of stealing the property, and wasting the lives, of others. And a presidential candidate is in the business of buying the votes of some by promising to make war on the rights of others. The prolonged exercise in self-denigration called a presidential campaign is made bearable by the prospect of personal exaltation that is the nearest thing to apotheosis one can experience in the flesh. After the most successful of the panderers places his hand on the Bible and perjures himself by promising to “preserve, protect, and defend the Constitution,” he is presented to the public as a figure shrouded in sanctity and wreathed with wisdom. His touch can heal, his words can conjure miracles, and – more to the point – his will is the supreme law (at least until his second term). That last provision reflects the most significant innovation from the reign of Bush the Dumber, the dogma of the “unitary executive,” crafted by John C. Yoo and other proponents of executive dictatorship. "To John Yoo, thanks for everything! 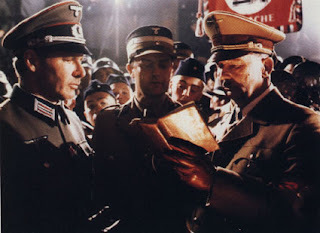 -- Adolph Hitler." The modern American presidency is a moveable feast calculated to sate every appetite whetted to a fine edge by the libido dominandi. Whoever he – or she – is, the US President immediately becomes the most powerful mammal on the planet. This is why anybody seeking the office (unless he emphatically and credibly seeks to reduce it to something like its constitutionally appropriate size) should be considered unworthy of holding any office of public trust. No, that's not enough: Such people should be regarded as enemies of all that is decent and worthy of preservation. Oh, like hell I do. I'm not kidding, or at least not entirely so. Really, if one pays careful attention to the Constitution's assignment of delegated powers, the office of the presidency is significant, but hardly awe-inspiring. In domestic matters, the president is an executive with modest (and qualified) powers of appointment; in diplomatic affairs, he's the country's official greeter, with some carefully hedged powers to make agreements. The presidential war powers are contingent, derivative, and limited, as defined by the Constitution. So in a very real sense, if reason were restored to her throne and we lived under the system authorized by the Constitution, the County Weed Control supervisor would have a greater impact on your life than the President of the United States. Such was the happy state of affairs in the United States prior to the advent of Abraham the Awful, Destroyer of Our Republic, in 1861. 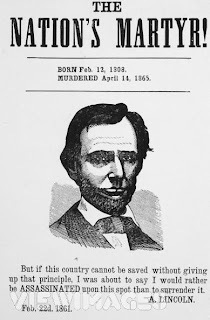 The modern cult of the presidency (no other expression will suffice) owes a great deal to the immediate deification of Lincoln following his assassination. Since that time, the presidency has come to be seen as a quasi-divine institution, having been hallowed by the shed blood of Abe the (putative) Savior of the Union, rather than being a constitutionally modest office that should be peripheral to our daily concerns. 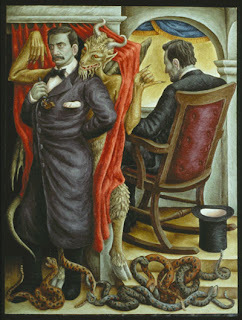 "Satan Tempting Booth To The Murder Of The President": This painting depicts the assassination of Lincoln in terms akin to the Passion of Christ. Alas, we confront in the presidency an office endowed with powers grander than the most emancipated dreams of Caesars, Tsars, Shahs and Kaisers. And at least one of the reasons why people approach that office with chastely downcast eyes, hands dutifully tugging the forelock, is because its extra-constitutional powers make that office so dangerous. We have to “respect” the office of president because, unlike the County Weed Control supervisor, the president can kill huge numbers of people on a whim. Indeed, presidents aren't truly seen as “presidential” until they have killed someone (or, as official sycophants would put it, they have “displayed leadership in an international crisis”). 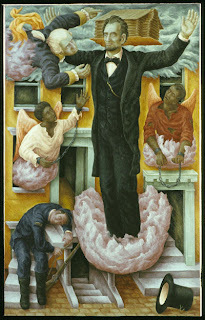 "Transfiguration": Here we see the murdered Lincoln portrayed as a literal "Christ" figure, ascending to heaven to be exalted next to the similarly deified Washington. So obviously the office generally appeals to exactly the sort of people who should be kept as far as possible from power of any kind. I can understand – if only in an anthropological sense – why such people are willing to carry out their half of the transaction through which presidents are made by humiliating themselves for months or years. What I cannot understand is why we play along by treating presidents as demi-gods, forgetting the myriad acts of conspicuous self-denigration that characterize the typical presidential campaign. Too many Americans – that is, too many of the minority who bother themselves to take part in politics – buy into the official myth that once the typical politician, reeking of corruption and disfigured with his lust to power, becomes president, he somehow becomes a sanctified being. 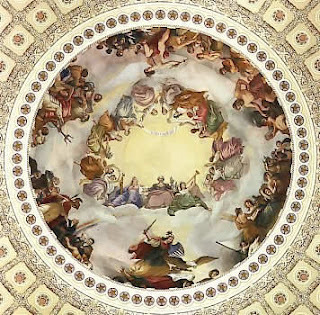 "The Apotheosis of Washington," a blasphemous rendering of the admittedly noble Washington's supposed ascent to godhood, displayed on the ceiling of the Capitol rotunda. A man who typically left the room rather than be exposed to flattery, Washington would be disgusted. The Cult of the Presidency, "Christian Right" Version: His Imperial Holiness George II finds solace in his burdens with the help of ascended Jedi Masters Lincoln and Washington, or something. Now let's go kill us some Mooo-slums! Unless employed by the executive branch of the federal government, or serving in the armed forces when they are called into the service of the united States by Congress, Americans do not have a president – much less a “Commander-in-Chief.” George Bush doesn't preside over me in any sense I can recognize. A common sight in recent years has been the random “My President is [fill-in-the-blank]” bumper sticker or protest sign displayed by some heretic unsatisfied with the incumbent short-term deity in Washington. That blank has been filled with the names of such dubious worthies as Charlton Heston and (I'm not kidding) former UN Secretary General Kofi Annan. I always wonder why people bother to fill in that blank. My president, I'm proud to say, is Nobody. Please be sure to visit The Right Source for news, commentaries, and to buy my book! 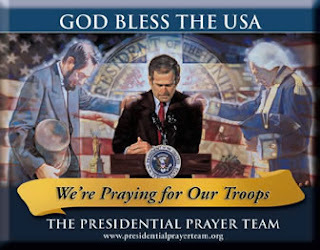 The picture of the ghosts of Washington and Lincoln laying hands on Bush was shown in a slideshow at my church as part of a "patriotic" tribute to our troops on Veterans' Day 2006. After a year of holding my tongue and being polite while listening to my pastor spout nonsense about Bush being "annointed by God", I got up out of that pew, headed straight for the door and never looked back. "And a presidential candidate is in the business of buying the votes of some by promising to make war on the rights of others." When the President buys the votes of some by promising to make war on the rights of others he is selling his soul. Shame on you Mr. Grigg! Where's your sense of decency? "Somewhere, someone's president is George W., aka President Simian, son of excrement, glorious leader of the uninformed idolatrous wicker people and Commander-in-Chief of the Empire of Sh*t!" Somebody put some ornery in your Cheerios this morning. Great article. I see only one flaw in your logic, and that is the flaw of assuming a President has a soul to sell. "Anybody seeking the [presidency] (unless he emphatically and credibly seeks to reduce it to something like its constitutionally appropriate size) should be considered unworthy of holding any office of public trust." This is the key point. With the constitutional balance of powers having broken down, the presidency has acquired the discretionary capriciousness of an imperial emperorship. Any candidate whose announced objectives do not include stripping the office of its accretions of unaccountable power is, by definition, a dangerous megalomaniac. Every candidate but one is ambitious to exercise those hypertrophied powers. None of these, regardless of party or platform, should be considered qualified to serve. The powers of a dictator are patently incompatible with democracy. "I Hate Rude Behavior In a Man"
Yoo's On First: Let The Lustration Begin!